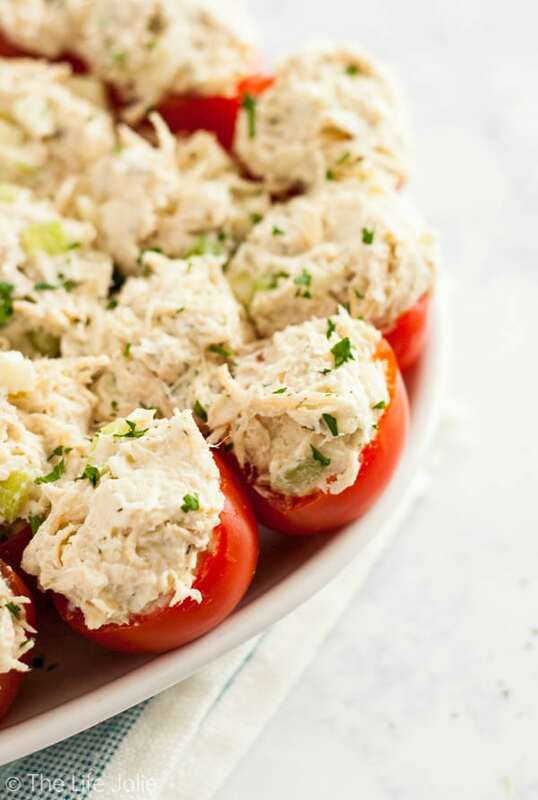 Chicken Salad Stuffed Tomatoes are a simple, gluten-free twist on a chicken salad sandwich. They’re made with Greek Yogurt and with apples and they’re super easy to make ahead. They make a delicious healthy lunch or game day appetizer! It’s nice to have a healthy, delicious option up your sleeve that’s super quick and delicious to put together, yet satisfying to eat. Bonus points if it’s gluten-free! 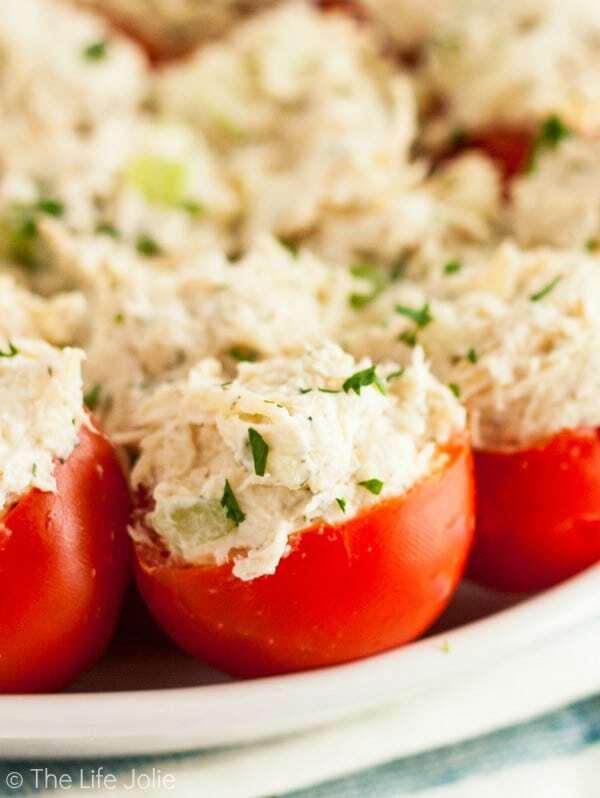 Meet Chicken Salad Stuffed Tomatoes. Chicken salad is one of my favorite things to bring to work for lunch. It is so quick and easy to put together and very satisfying. 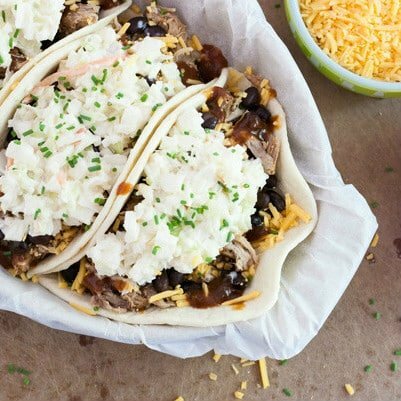 I like to prepare the shredded chicken in my slow cooker in advance and freeze it in one cup portions to make my life easier. I think the components of an excellent chicken salad are chicken that you cooked (none of this canned chicken nonsense! 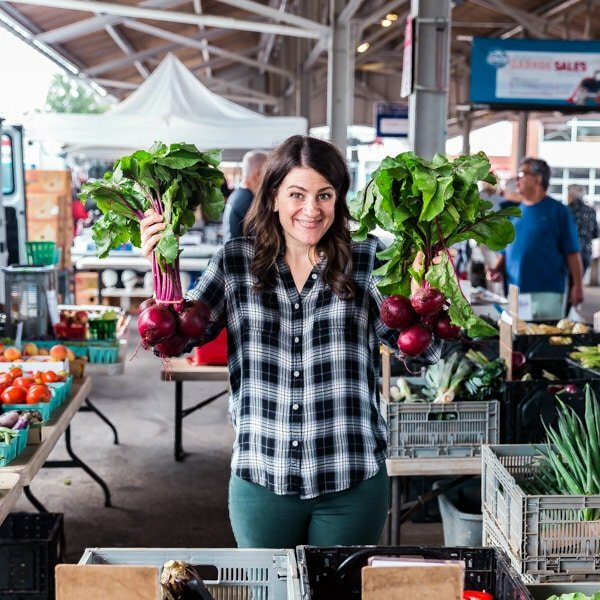 ), crisp celery for crunch, sweet/tart apples, some tasty herbs and seasonings to give it a little something extra, a bit of mayo and some greek yogurt to bind it all together and lemon juice to brighten everything up. 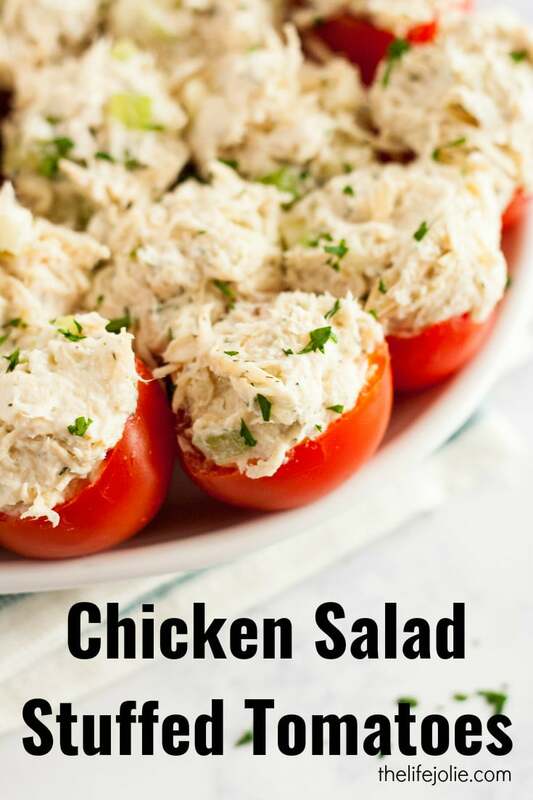 While this is always delicious as a sandwich with some fresh lettuce and tomato, I like to take the healthiness factor a step further and hollow out tomatoes to serve the chicken salad in. 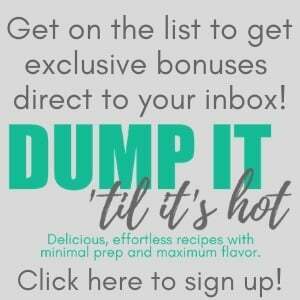 Not only if it extra healthy, but it’s so pretty and easy to make ahead of time. You can use large tomatoes or small Campari tomatoes (which are a bit bigger than cherry tomatoes) for a great appetizer to pass. This would be the perfect light lunch to serve to a group along with salad like this one or a nice cup of soup like this. I like to prepare the chicken salad and hollow out the tomatoes the night before so that all I have to do is stuff them the next day. Tomatoes, tops removed and hollowed out (this fills about 2-4 larger tomatoes like beefsteak or around 20 Campari tomatoes)- If the tomatoes won’t sit flat, take a very sharp knife and take a thin layer off of the bottom to help it stay put- be careful too keep it thin so you don’t create a hole in the bottom of the tomato. Mix the first 9 ingredients well. Taste them as you go along and tweak the seasonings to your taste. 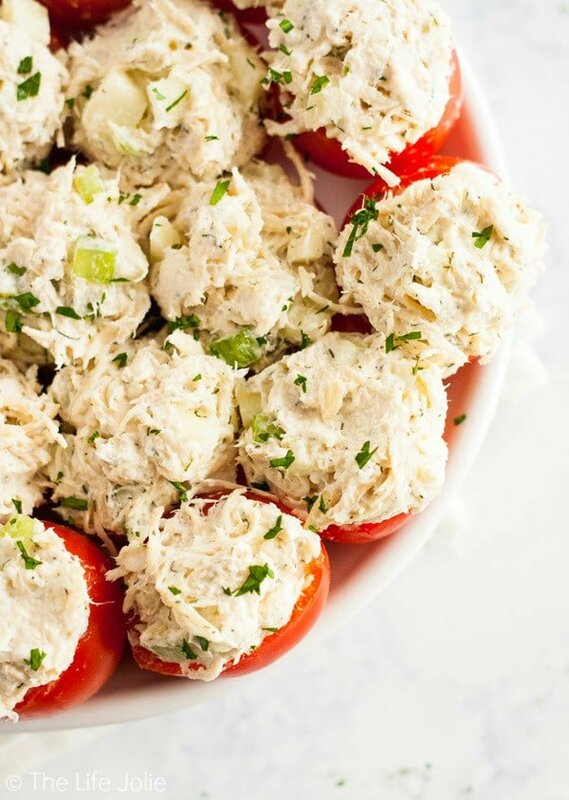 Carefully stuff the tomatoes with chicken salad. If they won’t stand up without falling, slice a very thing slice off of the bottom to flatten and create a base (be careful not to take off too much!). February 20, 2015 at 9:47 am Thank you- I actually added the tomato into the mix entirely for the purpose of presenting it in a pretty way when some ladies in my family joined us for lunch. Prior to that it was all bread. Thank you for stopping by! February 20, 2015 at 11:10 am I've never had anything like this! It looks amazing. 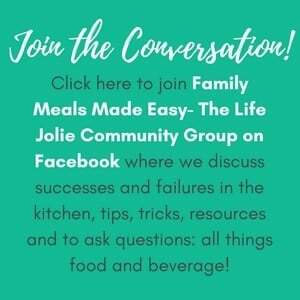 Linking up from Home Matters Linky PArty. February 22, 2015 at 7:59 pm It's one of my favorites in every season- I would totally make it with grapes as well, yum! I've had it with almonds at a restaurant before and loved that, I bet it would be delish with pecans. I hope you enjoy! Thanks for stopping by! February 22, 2015 at 11:27 pm Thank you, it is pretty tasty. Thanks for stopping by! February 23, 2015 at 10:49 pm Thank you for the kind words- I'mm all for the edible vessel for food- pretty, useful and delicious. Thanks for stopping by! February 24, 2015 at 10:47 pm Thank you and I hope you enjoy! My only regret is that I had to work with winter tomatoes, I know this will be even better in the summer. February 25, 2015 at 9:10 pm That's really awesome, thank you!